One hears a lot of talk regarding private clouds as the first step on a company’s cloud adoption journey. That may be a good start, but without adding the public cloud’s inherent multiplexing efficiency for a hybrid solution, the cost advantages of shared infrastructure will not be fully achieved. By most definitions, a private cloud does not share infrastructure among consumers. Al servers, storage, and network assets are owned, controlled, and paid for, by the company owning the private cloud. A private cloud contains many of the same servers, storage and network assets as your enterprise data center with a cloud infrastructure running on top of it. A private cloud implementation, however, offers many improvements over a typical enterprise server IT deployment. Agile allocation of compute and storage resources to the applications, when and only when required, improve deployment speed and permit more efficient utilization of IT assets while also enabling usage-based charge-back capability that can align IT use with its true costs. 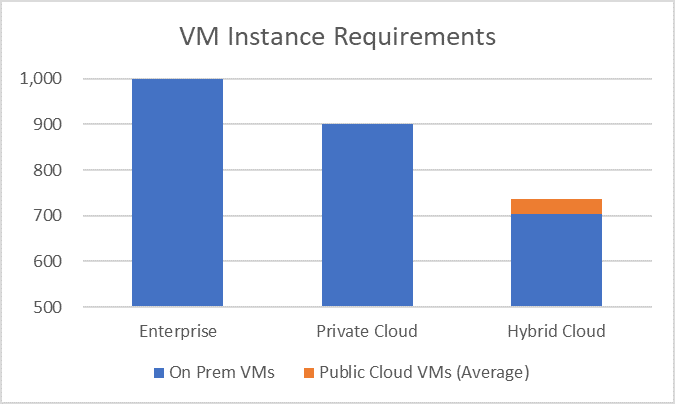 These improvements are substantial, but they still cannot match what is possible in a mixed (hybrid) Private Public Cloud environment. The simple reason is this: In a Private Cloud, you may be able to reduce the total amount of hardware you have in your data center via better CPU and storage sharing and utilization within your organization, but you will still always be paying for all your IT equipment based on your organization’s peak utilization moment. Indeed, this equipment must be paid for both when it is being used to the limit and when it is sitting idle. In a hybrid cloud environment, it is possible to obtain additional efficiencies and further reduce the over-provisioning of IT resources while also maintaining the on-premise option. Improvements in orchestration tools and middleware now permit relatively transparent movement of workloads from on-premise to the public cloud. This means that it is possible to lower overall IT resource consumption and shift those loads to lowest cost site. In low use periods, the lowest cost option would likely be on-premise and in periods of peak loads, it would be mix of on-premise and the lowest cost cloud provider. Hybrid cloud: Private cloud with capacity up to the enterprise average server utilization with bursting to the public cloud for any server capacity requirements exceeding the company average. The following graphs demonstrate simple mathematics driving the efficiency differences. Figure 1: With a conventional enterprise server farm, the on-premise IT infrastructure would need to be based on peak usage. In this example, 1,000 VMs would be required. 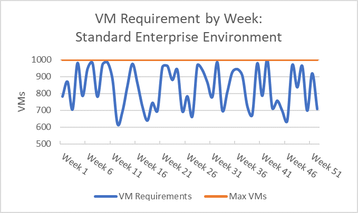 All moments where the blue line is below the Max VM lines, there is unutilized IT equipment waste. Figure 2: By way of better internal sharing and allocation of IT resources via a Private Cloud, the maximum VMs required can be reduced to 900 VMs. This improved sharing of resources increases the utilization rates of servers but the area between the 900 VMs and the actual usage line still represents unutilized IT equipment. The loss is much smaller, but remains. Figure 3: Using the allocation tools implemented in the Private Cloud and extending them to the Public Cloud enables further efficiencies. Rather than paying for, and housing 900 or even 1,000 VMs, this number could be reduced to the average usage level of 704 VMs. Bursts up to the peak of 900 VMs would be served via the Public Cloud with costs accumulating only when usage climbs above the number of VMs which are housed on-premise. The savings can be quantified by examining at the VM instances that must be paid for in each case. 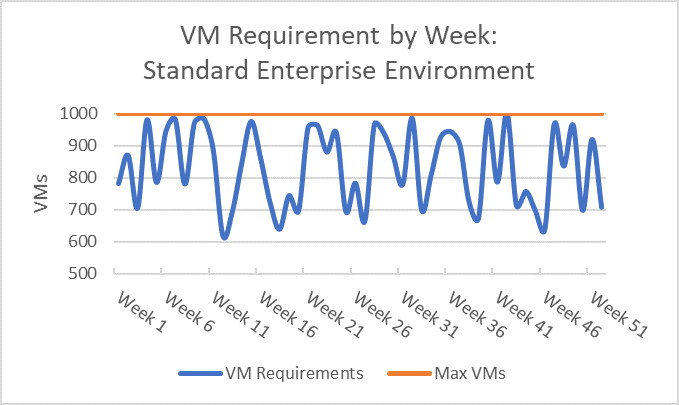 In the Enterprise case, the maximum load of 1,000 VMs must be provisioned and ready even if many remain idle for much of the time. In the Private Cloud case, this can be reduced to 900 VMs by better sharing and utilization within the enterprise. 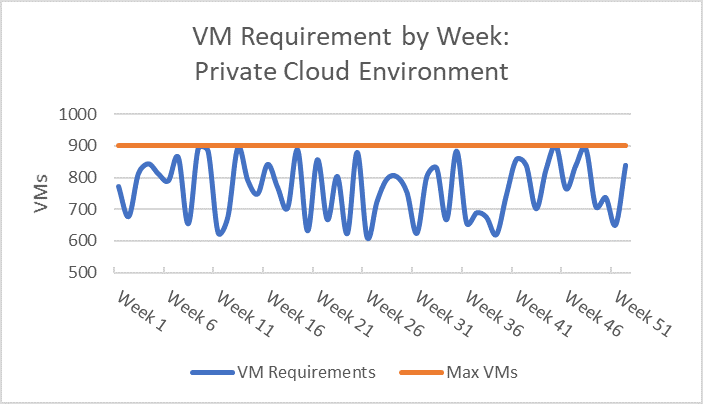 Finally, in the Hybrid Cloud case, the average load of 704 VMs would remain on-premise and the average load in the public cloud would be just 32 VMs which reflects the VM requirements that would burst to the Public Cloud. Compute costs could be reduced to 736 equivalent VMs. 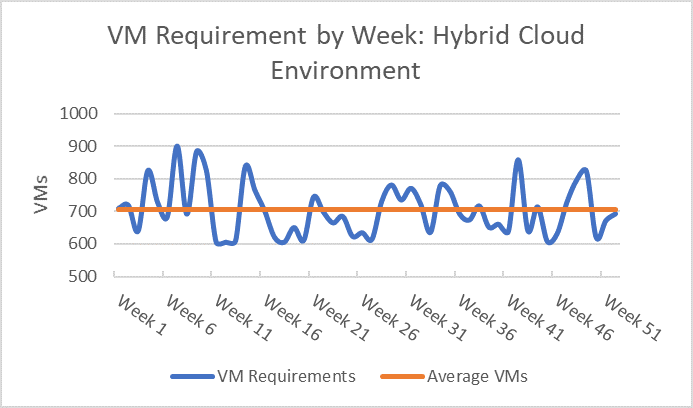 The key driver is that in the Hybrid Cloud case, the VM costs can be reduced to average usage levels both on-premise and in the public cloud. 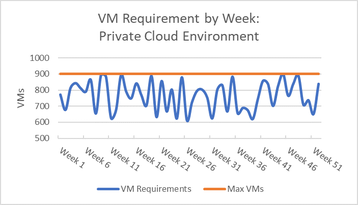 Conversely, in the Enterprise and Private Cloud cases, VM costs are driven by the peak usage level. 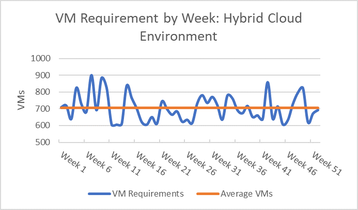 This example uses only virtual machine instances to demonstrate what enables savings in a Hybrid Cloud environment, but the same concepts apply with storage and container-based workloads. Cloud cost transparency can improve IT cost allocation to reflect the IT and facility costs and if such costs are distributed to users accordingly, they will reduce frivolous and/or unnecessary IT demand. 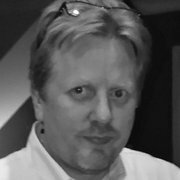 Conversely, cloud adoption without accompanying governance can result in uncontrolled cloud usage that could offset the possible gains noted above. The Hybrid Cloud model serves as a transition phase and proving ground for the more complete future cloud adoption journey that could yield even larger savings. Finally, this analysis considers the IT side of the resources but naturally, the lower requirements will eventually (but not linearly) translate to lower loads and costs in the enterprise or colocation data center.